As we’ve already mentioned, you need five representative users. If you have several distinct personas for your product, you should strive to find five users for each target persona. Strive for five – that’s a good way to look at it. Observing the user in their own environment can often reveal usability problems with your product that you might never have expected. They might reach for their smartphone to browse a website by default rather than the laptop. They might be attempting to use the product one-handed while on the phone. They might accidentally hit ‘back’ in the browser because they’re using a 5-button mouse instead of a more usual one. They may struggle to click on something using a touchpad on their laptop. Their keyboard layout may be set for a different language to the one you were expecting. 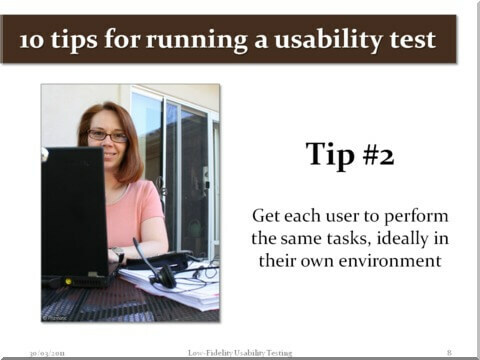 It’s not the end of the world if you can’t run the usability test in the user’s own environment though. To recap from the previous article on preparation, find a quiet room to run the test where you won’t be interrupted. 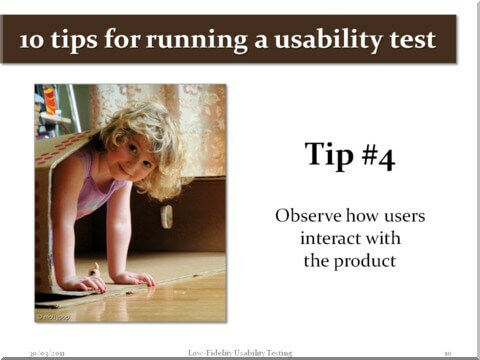 Your objective is to put the user at ease, so if outside of their usual environment, reiterate that you’re not testing them, they’re helping you to test the product – they can’t get the test “wrong”. Getting the user to commentate on their thoughts, actions and expectations allows you to ‘read’ their mind. However, it is unnatural for the user and a little difficult, if not slightly embarrassing in some cases. 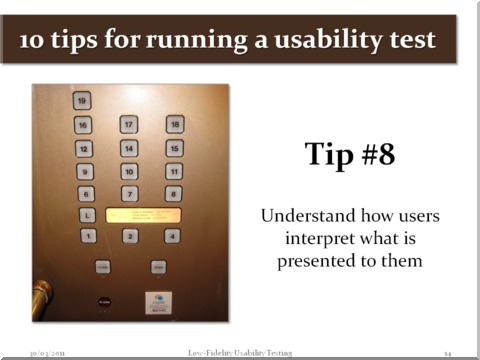 Put the user at ease by giving a quick example yourself and explaining why it’s helpful. 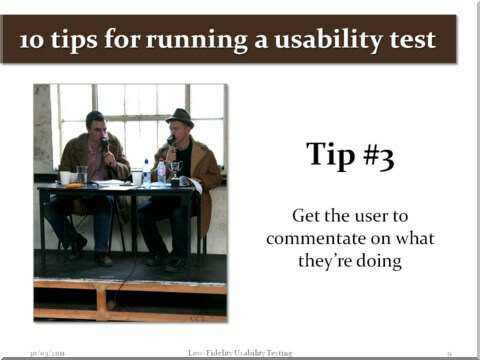 One of the main advantages of carrying out usability tests in person, as opposed to remotely, is that it gives you the fantastic opportunity to read their body language closely. This can often be more revealing than their actual commentary. jump out of the product to look for help on Google. This is a tricky balance to strike. On the one hand, allowing a user to get well and truly stuck gives you a chance to test out how well the product guides the user to resolve the problem (if at all). 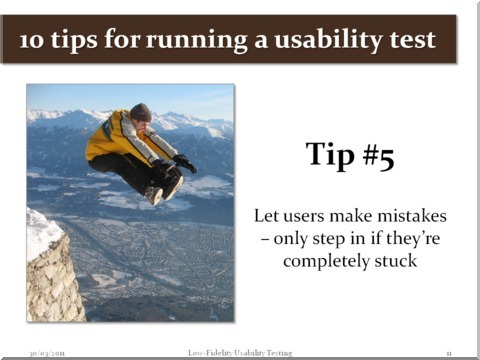 On the other hand, you don’t want to leave the user to struggle for too long otherwise they’ll become frustrated. If you as the moderator are familiar with the product, you have to suppress the urge to solve the user’s problem for them. This can be frustrating for you! 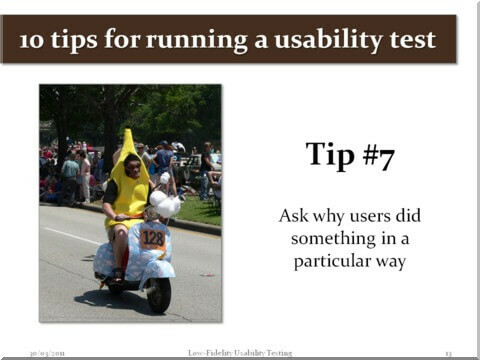 Remember that what is obvious to you as a relatively expert user may not prove to be so for the test user. If you do step in to help, only get them just back on track then let them continue from there unassisted. Note down things they did as well as things they missed. Observe body language, time to find or do something. Record their misunderstandings, annoyances, unexpected events. 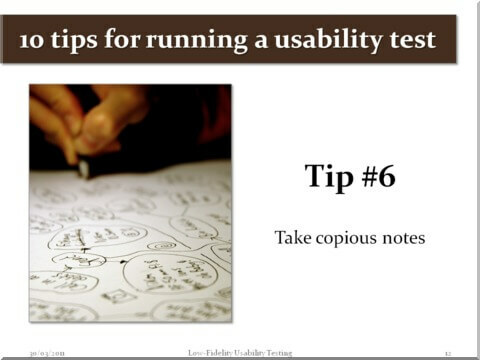 You’ll quickly begin to see recurring patterns once you’ve tested a few users. Highlight these for later. Probe expectations: participants usually have expectations about what will happen before they click on something. Well-timed questions asking them what they expect can reveal a lot about their perception and understanding of the product. Investigate mistakes: it’s always a good idea to follow up mistakes with a gentle question to understand why, especially when the participant doesn’t realise they’ve made a mistake. Also, avoid questions about their likes and preferences. This tends to add bias and turns users into instant design experts. This is not that helpful if you’re primarily interested in how easy the product is to use. Another hindrance to good usability is when users simply fail to understand what is being presented to them, either because it’s visually confusing or because the words or icons used don’t make sense to them. One product I tested talked about mapping field names to columns in a table of data. At least two users were confused by the term “mapping”, expecting some kind of geographical map to be involved. 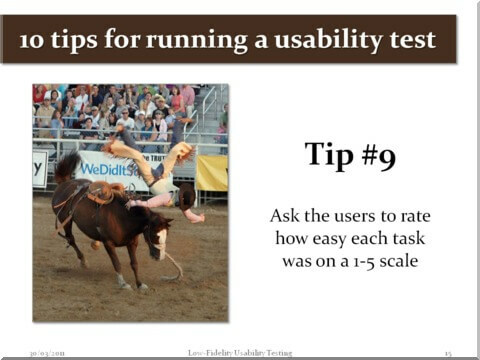 It’s important to get users’ feelings about a task just after they’ve finished experiencing it. This is because a user will tend to take a more moderate view of a past event the longer it has been since it happened. You want to appreciate and record a user’s true frustration or joy at the time. You may get some interesting results as users put the whole experience into context. It is perfectly possible that the user has struggled with a couple of the individual tasks, but rates the overall experience positively. 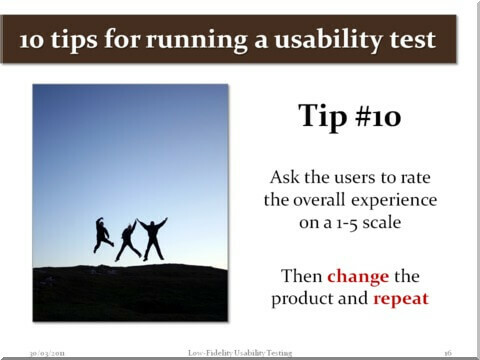 Assess whether your users’ needs still match up with the problems you believe your product is meant to solve. 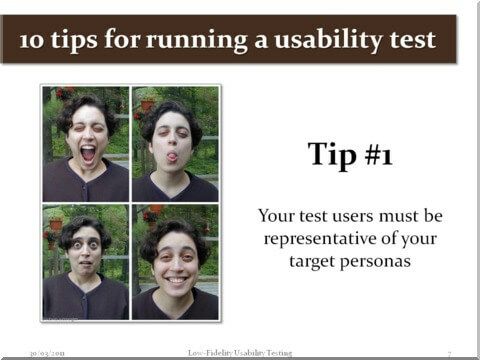 This entry was posted in Usability and tagged questions, top tips, Usability, usability testing, user personas by Jock Busuttil. Bookmark the permalink.